Alfonso Fuentes is better known for his classical work that has been performed – and recorded – by musicians of some of the most celebrated symphonic orchestras in the world. But like the great composer and pianist Nikolai Kapustin, he is drawn to a considerable freedom in ideation which often results in the dissolution of borders or boundaries that seem to separate styles and periods in music. Not surprisingly – also like Mr Kapustin – he was inspired to record this music, which is completely improvised and – more importantly – absolutely expressed in the moment. Here, as a Puerto-Rican pianist of Afro-Caribbean heritage he, naturally gravitates to the rhythmic side of his personality. Also he naturally reveals himself to be a pianist in love with his left hand. 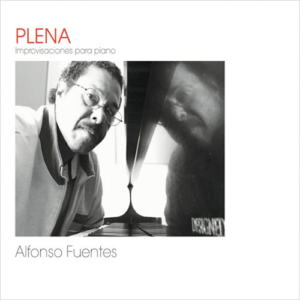 Thus we hear places in this music – which he calls Plena because it has been inspired by “the beat of panderos (Puerto Rican hand drums) accompanying a solo leading voice…” as he says, in his booklet notes – where the improvisations signal that it (his left hand) should dominate. But Mr Fuentes is also quick to seek out by ways and inner voices that lurk beneath the top line. The left hand often leads the ear, cherishing motivic snippets, highlighting an arresting harmonic progression, recalibrating the terms of discourse. It can be seductive as in the case of “Cortaron a Elena”, and rarely if at all, distracts or undermines (from) the bigger (melodic) picture. In that song, for instance, his distinctions between solo and ripieno intertwine beautifully so that both become fused in a crystalline articulation; each of the individual layers being sensitively managed at an ideal tempo forestalling maudlin , and the finale (of the piece) fairly fizzes as the piece – and storyline – is brought to its ultimate dénouement. Remember this is a pianist who has almost always been immersed in the western classical tradition of music, but that is where the intellect leads him from all his study and practice, he is also seduced by the traditional sounds of Puerto Rico that swirl around him. And so in the programme we have such gems as “Canción para Thaís”, a gleaming gem that celebrates the vivacity of his daughter. And even though the programme seems to have flowed somewhat unplanned the mind has roamed the island’s history and what have also become vivid stories that concern life and letters in the Puerto Rico of today. The former is captured in the two variations of “Montuno” and most memorably in “Memorias Campesinas” and the latter in “Plena al Pensamiento Crítico” which becomes a veritable roar of anguish as the dissonant elements develop through the middle and end of the piece. “Audabe: Canción Para Este Día” is the only through-composed work here and is also taken at a fair lick, which takes no hostages in its whirligig velocity. It is muscular, exhilaratingly voiced and utterly lucid. This is music that is in the moment; but like much music that unfolds in this manner nothing is wasted. Everything Mr Fuentes plays bedazzles and delights from start to finish.